Shakthan Thampuran was a ruler of the erstwhile Kingdom of Cochin. The word shakthan means powerful, and the king, whose actual name was Rama Varma Thampuran, was called so because he was a powerful ruler. The palace he left behind in the town of Thrissur evokes many memories, questions, and curiosities in the minds of the viewers. The curtain has forever fallen on the dynastic rule by royal families but historians have a lot to study from palaces that were erstwhile power centers. Shakthan Thampuran Palace can be especially interesting for those who are interested in the history and strategies of Perumpadappu Swaroopam which was the ruling family of Kochi (Cochin) to which Shakthan Thampuran belonged. The period of Shakthan Thampuran’s rule (1790-1805) is known as the golden era of the kingdom of Cochin. Though he ascended the throne rather late, he was extraordinarily talented and focused even as a young man. After he became the ruler, he maintained good relations with the British who wielded enormous power in those days, and also with other South Indian kingdoms like Travancore and Mysore. He played a significant role in eventually making the city of Thrissur the cultural capital of Kerala. 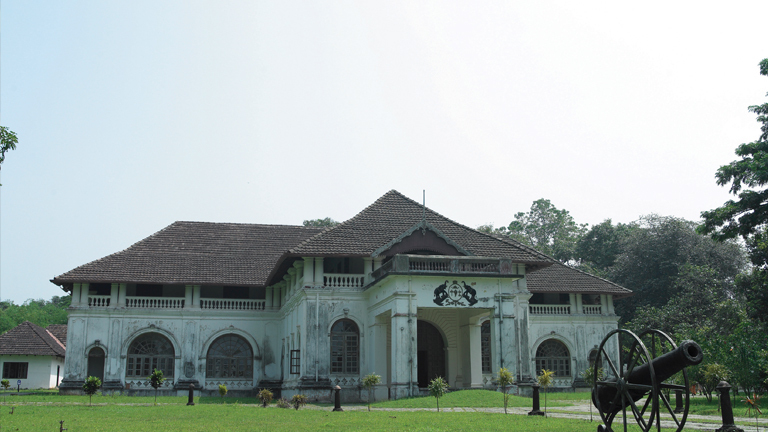 The original name of Shakthan Thampuran Palace was Vadakkerchira Kovilakam. (The word Kovilakam means royal family residence.) It is situated near the well-known temple of Thrissur, the Vadakkumnathan Temple. While remodeling the palace into its current form, Shakthan Thampuran incorporated local as well as Dutch elements of architecture. Its basic structure consists of a two-storey building, built in the Nalu-kettu (four blocks) style of Kerala architecture in which four blocks of residential quarters are built around a central courtyard. The rooms of the palace are spacious, floors are paved with Italian marble, walls are extra-thick, and roofs are very high. Such a construction style protects the residents from the ill effects of the weather to a very large extent. Shakthan Thampuran died in 1805 and was buried in the Shakthan Palace and so were another ruler of the kingdom of Cochin and a Zamorin (ruler of Calicut) as well. There is evidence to prove that Tipu Sultan of Mysore was a visitor to the Shakthan Palace and there is also a claim that he built a flag mast there. The palace’s old Sarpakaavu or shrine for serpents, the likes of which were present in many Kerala homes in those days, is still preserved. The whole place is now protected by the state’s archaeological department and it was turned into a museum in 2005 with the help of Kerala Tourism Department. On the south side of the palace is the Heritage Garden, called so because it houses many special local plants and trees. The Archaeological Garden at the northeastern side has collections of locally-found specimens dating back even to the Stone Age. The museum consists of a Bronze Gallery, Numismatic Gallery, Epigraphy Gallery, History Gallery, Sculpture Gallery, and Megalithic Gallery. The Bronze Gallery has a good collection of bronze statues dating back to the period from the 12th to the 18th century. The coins displayed in the Numismatic Gallery are mainly of the erstwhile kingdom of Cochin, together with the coins from some of the neighboring kingdoms. The granite statues of the Sculpture Gallery are mainly from the 9th to the 17th century. Epigraphy is the study of writings and their meanings, and the gallery here tracks the development and fruition of many early writings. The displays in the History Gallery focus on the contributions and achievements of the rulers of Cochin, and the Megalithic Gallery, as the name implies, has got specimens dating back to the Stone Age. There is even a gallery that showcases the kitchen appliances and utensils used by the former rulers of Kochi. In short, the galleries have recreated much of the Kochi that has vanished behind the curtain of time.